This recipe is not only an excellent balance of protein, fat, and carbohydrates to keep your blood sugar stable, but it’s also packed with vitamins and minerals to protect your body and boost your energy. Prepare salsa by placing all salsa ingredients in large bowl and stirring until evenly combined. Store in refrigerator while you make the fish to let the flavors marinade together. Combine coconut, cayenne pepper, garlic power, salt, pepper, and lime zest. Transfer to a plate. Pat fish dry with a paper towel. Dip fish first in egg white then in coconut mixture. Spray tops of fish lightly with cooking spray. Place on a well greased baking pan or ceramic dish and bake for 10-12 minutes. Turn on broiler and broil for an additional 3 minutes or until coconut turns to a golden color. Remove from the oven and flake fish with a fork. Warm corn tortillas in the microwave. 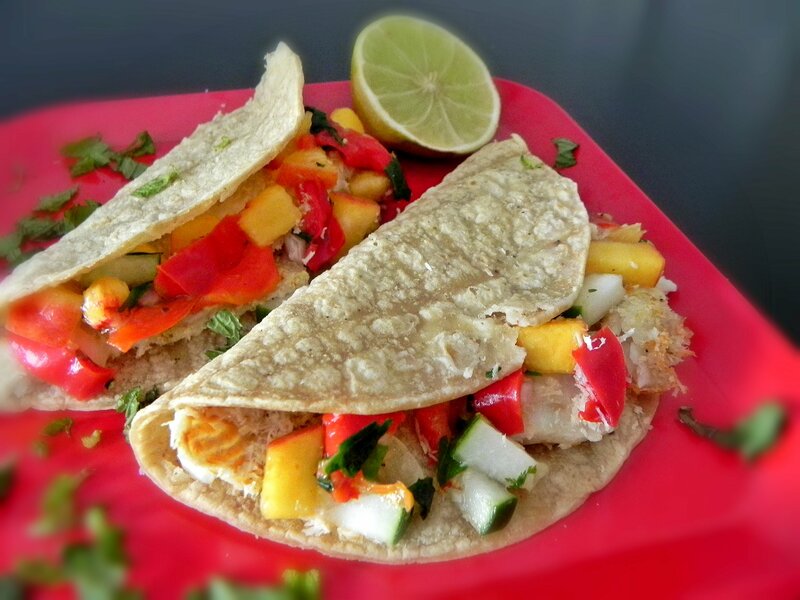 Fill tortillas with fish and top with salsa. Recipe makes 6 tacos with 2 tacos per serving.